In our discussions of worship we’ve learned that worship is more than a song. Worship is more than just what we do once a week in a congregational setting. Yesterday, we discussed the importance of having “Daily Altar Time”; a daily encounter with Jesus through prayer, Bible reading, journaling and other spiritual disciplines. But worship is more than that, too! How much more, you ask? Well, to be quite frank: Jesus wants all of us, all of the time. Jesus wants us 24 hours a day, 7 days a week, 365 days a year. You might be wondering: how can this be? How can I worship Jesus 24/7? Am I even capable of doing that? Most of visualize this type of worship as something that monks or “sainted” people do, requiring intense effort, postured on your knees with your eyes upward to heaven, and being still for a very long time. In our time-poor culture, the idea of worshiping Jesus 24/7 sounds about as outrageous taking a trip to Jupiter! Let me share with you that 24/7 worship of the Lord is nothing like what most people think. It is not restricting, but freeing. It is not passive, but active. It is does not require an intense effort; rather, it eases your burdens. You don’t have to rearrange your schedule to do it; in fact, it works best in the midst of whatever you are currently doing. It’s not an “add-on” to life; rather, it effectively takes away negativity in life – stress, anxiety, fear, shame, impatience. Best of all, it is transforming. It transforms your situations, your relationships, and most of all … you! You become a better person when you become a 24/7 worshipper of Jesus. The key to becoming a 24/7 worshipper is to simply allow Jesus to enter into your everyday activities. As you drive to work/school, allow Jesus to give you grace for the day. As you encounter people, allow Jesus to guide your conversation. As you face a decision, ask Jesus to give you counsel. As you wait in the grocery checkout stand line, allow Jesus to guide you into prayer for the people in front of you. As you eat dinner with your family, ask Jesus how you can build up your family members. As you lay your head on your pillow to sleep, allow Jesus to guide your dreams. As you do this, you will begin to see remarkable things happen. God will open up opportunities for you. You will hear His voice. Your attitudes and perspectives will change. Hearts will soften before your eyes. You will experience the Kingdom of God in power because you are giving King Jesus access into your life. We laugh (or cry) when we hear that joke, but how different is that scenario from our own lives? Do we allow Jesus to enter our lives only when there is a crisis? We call Him, “Lord”, but do we give Him access to our everyday, ordinary activities? One more thought on 24/7 worship: don’t try to give Jesus your whole life at one time. In attempting to give Him everything, we often wind up giving Him nothing. How many times have we stated to God (perhaps in a song or a prayer), “I give you my whole life; I give you everything!” and then, in the very next moment, we do something entirely selfish or ungodly? The truth is this: we are incapable of giving Jesus everything all at once. To think we can do so is delusional. But we can give Jesus one moment at a time. And that is a key to 24/7 worship. Don’t try to give Jesus all your moments, but try to give Him the next one. The idea is to give Jesus more and more access each day. 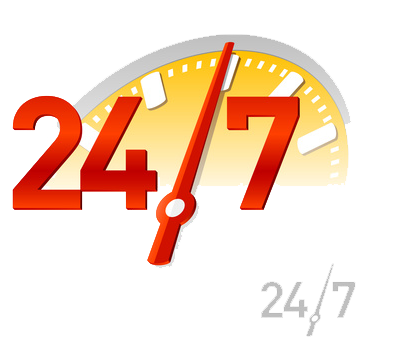 “24/7” is not a starting place; it is a vision. A vision for your life; a vision that can and will happen as we take “baby steps” in whole life worship. In the coming weeks I will share some practical examples of how to live out 24/7 worship of Jesus. In the meantime, I encourage you to step out and give Jesus permission to come into the moments of your life (and I invite you to share with me your experiences in your pursuit of 24/7 worship). It will open your heart and eyes to a fresh, new reality – the Kingdom of God. Every hour, every moment; Lord, I want to be Your servant. I desire to be a blessing in Your eyes.